Back in September, my little Abigail decided she was going to go broody, and seeing as I had no clue what I was doing, only had 3 or 4 hens laying, and again, had no idea if I was prepared for a broody hen, I decided to attempt breaking her broody. Guess what, peeps? I’m broody again. Yup! Abby is broody again, in a little less than two months. 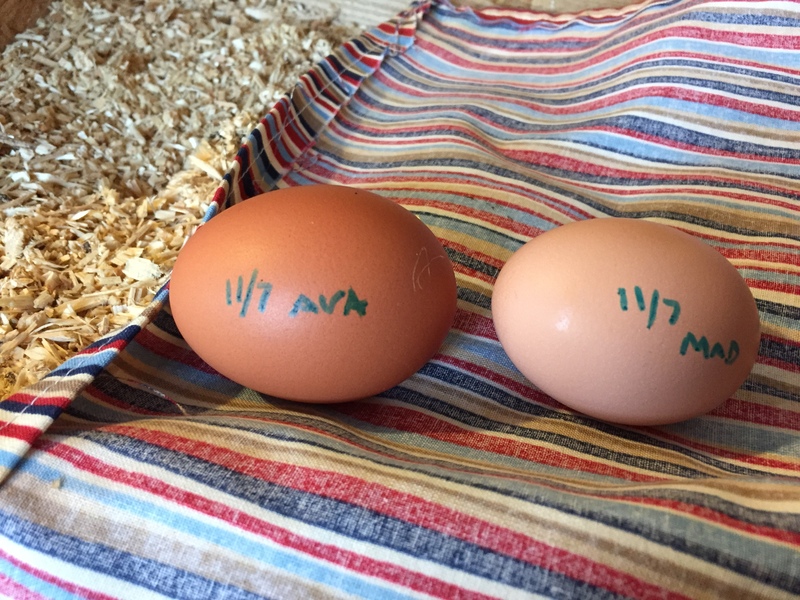 I suppose I should have guessed it when she started spending longer times sitting on her eggs, but I didn’t because I had started going down to the coop earlier in the mornings recently and I just thought she hadn’t laid her egg yet. But nope, we found her in the laying box Friday afternoon, well past her usually laying time, all puffed up and softly buck-buck-buck-bucking. 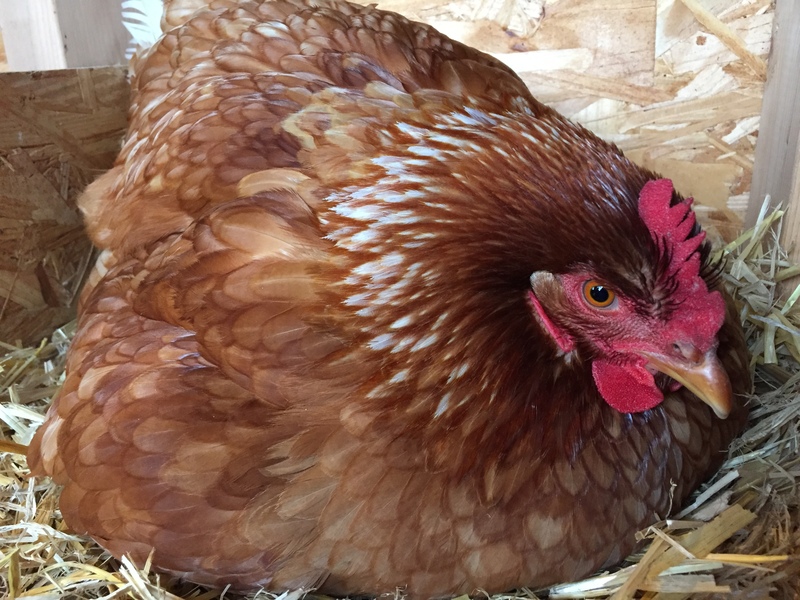 Abby is the sweetest little hen when she’s laying. She lets me pet her, doesn’t bite or scream at me, and in broody form, she is no different. Anyway… after the last time she went broody, I learned two things. 1) Putting her in the broody breaker cage is heartbreaking and 2) it doesn’t mean she’ll go back to laying eggs right away. In fact, she STILL spent 3 weeks not laying eggs. 1 week being broody and upset with me because I put her in a dog cage, and 2 weeks of ‘downtime’ before she laid an egg again. I decided that, for all the hassle, I could have just let her go broody and sit on the plastic egg. Or… put an egg under her and see what happens. Flash forward by slightly less than two months, and she’s once again broody. I spent Friday trying to decide what to do, put her back in the breaker or let her do what nature intended for her. Curiosity on my part won out. If she’s going to not lay an egg for 3 weeks anyway, she might as well hatch something and see how it goes. Maybe she’ll she be a good mama, who knows? The eggs are not hers. I put the last eggs I know was hers in the fridge Friday afternoon, and I couldn’t really tell which one it is. However, Saturday morning, I just happened to be in the coop in time to witness two of our morning layers doing their thing. I scooped the eggs up, marked them, and slipped them in the box with Abby. She did the rest. Ava is a gold sexlink, like Abby and our rooster, Double Dots. Madison is a Rhode Island Red. I do NOT know if these eggs are fertilized. I have not candled them, I have not touched them since they were laid. What happens next is going to be determined by Abby and nature. I will say that Dots does appear to be doing his job quite well. Most the eggs we eat in the mornings have been fertilized eggs, so there is a high chance these two are, as well. I’m sure if I want to candle them at all. I might just want to let things happen as they will. I may be setting her up to fail, seeing as winter is close around the corner. Who knows? But, if the stars align, sometime around Black Friday, I could have two little chicks. I will admit, I am very curious about the genetics. I used to breed cows, so animal genetics in breeding is not foreign to me. But I have how it works in chickens. Since Ava and Dots are both sexlinks and came from the same batch of chicks, their chick should also be a sexlink. But Madison is a RiR, so I’m curious what the baby will look like. Which traits will be dominant? Will the traits depend on if the chick is male or female? So many thoughts. If the eggs results in chicks, we’ll find out! I like your solution. Keep us posted. She seems happier, to be honest. This morning she climbed out of her nest and ran around with the flock for 5-10 minutes, ate a bit and ran back in to sit on her eggs. Good, at least she’s eating and drinking. I’ve got three broodies right now, two never seem to leave the nest. How did she do? Have they hatched yet? One of them hatched Friday night. An adorable little bit of fluff we’ve named Pip. The other has not, but Abby has showed no signs of abandoning it just yet. I’m committed to giving it until the weekend before I give up on it hatching. Just in case. I went looking for other posts and saw Pip.. Adorable. Congrats on the baby. Look forward to updates as she grows.. Thanks! Pip is such a cutie. I wish the other egg would hatch, so Pip could have a friend. Momma is still sitting on it but I grow doubtful with each day.